The three of us here at Lady Business have always been interested in the way the gender reading gap is perceived and discussed, both in the mainstream media and in the blogging world. We're particularly interested in what the focus of these discussions often reveals about the pervasiveness of sexist assumptions: Renay has been writing commentary on the topic for a very long time; Jodie wrote an in-depth series of essays examining the issue; and I researched the gender reading gap from a non-essentialist perspective for my MA dissertation. One of the ideas that repeatedly surface in these discussions is that the reason why teenage boys don't read is because there's an alarming shortage of YA novels with male protagonists. This alleged overwhelming predominance of girl protagonists in YA (which some have linked to the "unconscious biases" of the women who supposedly dominate the industry) is scaring teenage boys away, and this lowers their chances of becoming lifelong readers. However, these arguments are based on speculations and anecdotal evidence rather than on statistical data. Last year Jodie suggested crunching the numbers and seeing what they'd actually show us, and I have taken on this project because the notion that women dominate YA literature keeps resurfacing. It's interesting how a slight predominance of female authors on a list immediately makes people think "female dominance". If the numbers were reversed, we would perhaps say appreciatively that the list was close to being gender balanced. We expect to find male dominance everywhere - anything else is an unusual occurrence, and as such it stands out. And this affects how we view the world far more than we realise. So often at the store, we hear parents say about a great book, “Oh, he won’t read that. It’s about a girl.” Really? By accepting and perpetuating, pandering to, this mindset, we are basically saying — to ourselves, each other, the boys, and most damagingly, to girls — that it’s okay not to have in interest in the experiences of HALF THE HUMAN RACE. I mean, it’s not even possible not to be interested in what half of the world does and says and thinks. And we wonder why there’s an empathy problem in our culture…." The goal here is not to pander to this mindset, but to help erode it by moving the debate away from factually incorrect assumptions. Plenty of other people have written sensibly about the cultural origins of this problem and about how even the best intentioned adults keep reinforcing it - you'll find several examples under "Further Reading" at the end of this post. My hope is that by pointing out the lack of empirical support for the claim that YA books about boys are non-existent or at least very obscure, we can help challenge simplistic explanations for the gender reading gap and begin to move the conversation towards a more thoughtful and complex approach. Anecdotal evidence is a tricky thing: I've seen plenty of people who are immersed in the world of YA literature say that this shortage of stories about boys is something they see with their own eyes every day. I believe that these people are knowledgeable, honest, and have the best of intentions; but the problem is that most of us aren't anywhere near as good at identifying patterns or trends at a glance as we think we are, and confirmation bias affects us all. These days the conventional wisdom is that YA simply is female dominated, and if a shortage of books featuring boys is what we expect to find, chances are we'll find it. This is not the result of deliberately dishonesty, but simply of how the human brain works. It's also why we decided to crunch the numbers instead of simply pitting our impressions against other people's. 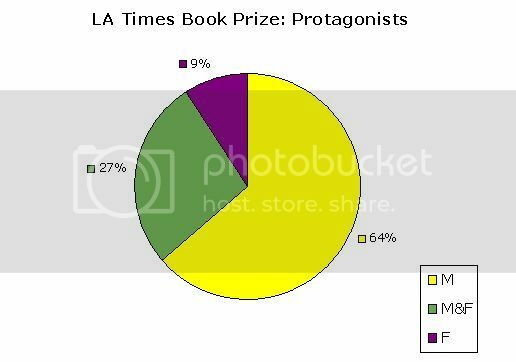 In a perfect world, this project would be a gender breakdown of all YA novels published in a year, similar to Malinda Lo's LGBT YA by the numbers project. However, I simply don't have the time or the resources to do something with that kind of scope - none of us here at Lady Business do. It would be slightly more feasible if we drew a representative sample of manageable size from all the YA published in English in, say, 2011; but to be able to draw a random sample we would need to have access to a sampling frame - a compilation of complete publication lists from every English-language YA publisher. The sample would only be guaranteed to be representative if the sampling frame was truly exhaustive. Malinda Lo explains on her blog that she used pre-existent bibliographies compiled by Christine Jenkins and Michael Cart for her project, but unfortunately I don't have access to anything of the sort at the moment. But if anyone with more resources is interested in undertaking such a project, I'd be very interested in the results. 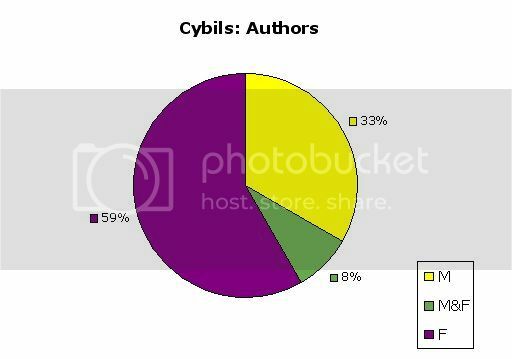 Such data is available out there (it was used, for example, for the YA cover colour project), and therefore someone with more time could investigate the gender balance of protagonists and authors for everything published in a year. What Jodie suggested we do instead, then, was focus on the winners of 22 major awards that are either devoted to Young Adult literature or are general and genre-specific awards with YA categories. We picked award winners because these are books with high visibility, which makes them particularly well-suited to this project's purpose. If we found no shortage of stories about boys in this particular sample, this would go a long way towards demonstrating that such stories are not in fact invisible. Awards winners are of course only a very small share of all the books published each year, but they're also books librarians are likely to recommend; books parents, teachers, other educators, YA bloggers, and teen readers themselves are frequently exposed to and spend a lot of time discussing. Lists of award winners are valuable resources, and so a gender breakdown is a useful indicator of how visible books with male protagonists are in the world of YA at large. The sample was compiled using our previously existent knowledge of the YA book world to decide which awards were the most renowned. These impressions were confirmed, and the list was further expanded, using expert resources such as the Cooperative Children's Book Centre List of Awards and Best-of-the-Year lists and Bookshelves of Doom's extensive coverage of YA awards. A wide range of genres was covered by including the YA categories of several specialised awards such as the Nebula and Mythopoeic Awards (Science Fiction and Fantasy) or the Edgar Award (Mystery). 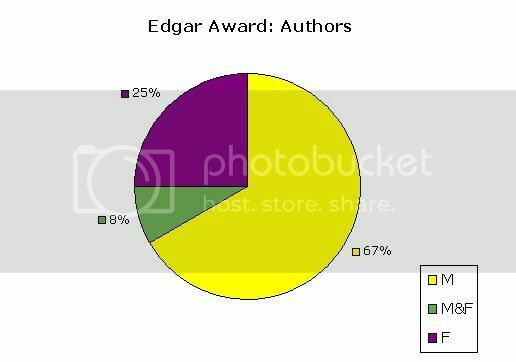 Additionally, the awards included come from several corners of the English-speaking world; again, I lack the resources to examine trends worldwide, but I would encourage anyone inclined to do so to go ahead and share the results. You will have noticed that some of these awards are named "Children's Fiction" or "Children's Literature": the terms "children's literature" and "Young Adult literature" are sometimes used interchangeably by award committees, so I used my judgement as a reader, blogger, and someone who is immersed in the online book world to decide where to draw the line. The Mythopoeic Award, for example, is ostensibly called a children's literature award, but a quick look at the list of past winners reveals that most have been marketed as YA. The same goes for the Costa Awards, whereas the Carnegie medal in the UK shares winners with both the Newbery and the Printz in the US. 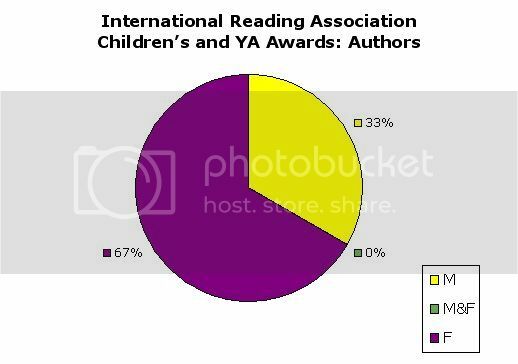 Unlike ALA, CILIP doesn't distinguish between children's and YA literature by creating two separate awards. 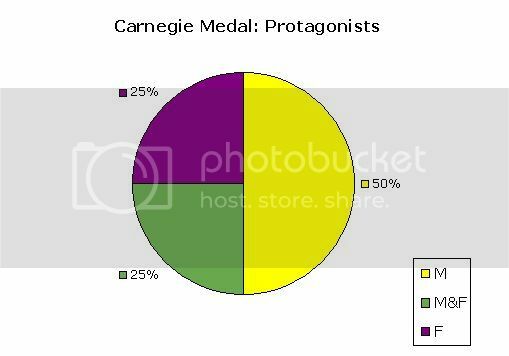 For this reason, the Carnegie Medal was included but the Newbery Medal was not. 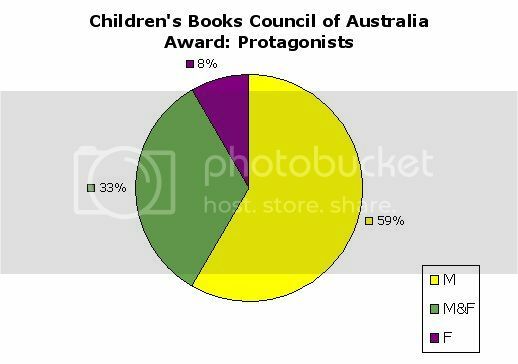 Again, if anyone is interested in crunching the numbers for awards specifically aimed at contemporary children's literature to see if there are any differences, we would be happy to see it happen. There was no cherry picking: once an award was selected, it stayed regardless of what the gender breakdown revealed. 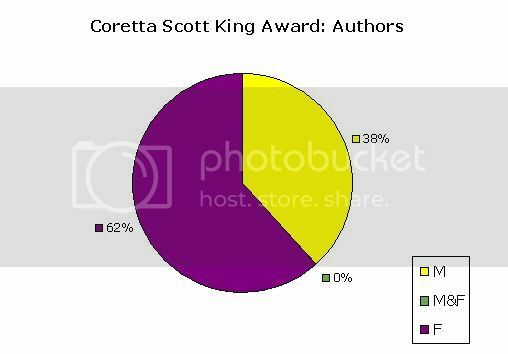 There were, however, a few awards that posed challenges: for example, many of the winners of the Coretta Scott King have been non-fiction, and the winners of the CBI Awards range from picture books to YA novels. 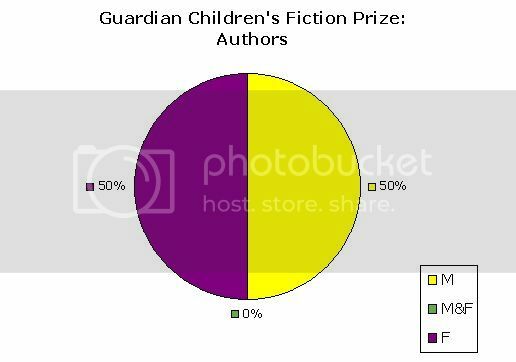 Non-fiction and poetry titles were left out of the protagonist count but were included in the gender breakdown by author; while books aimed at very young children were left out altogether to avoid confusing the results. The focus of this project is YA rather than literature aimed at younger readers; however, as I said previously, if anyone is interested in running the numbers for books aimed at different age groups we'd be very interested in the results. I don't think we have missed any major national awards, but regional and state-specific awards, which exist in the US, Canada and Australia, were left out to keep the scope of the project manageable. 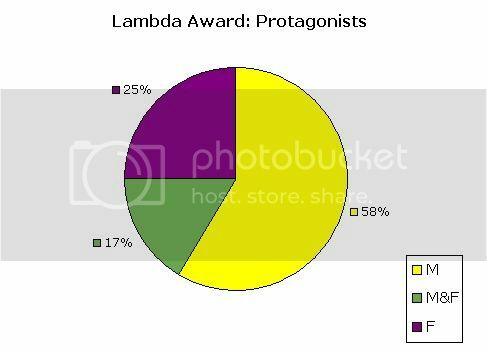 The raw data for this project is publicly available, though, so if anyone wants to add to the count by including these awards they're more than welcome to do so. 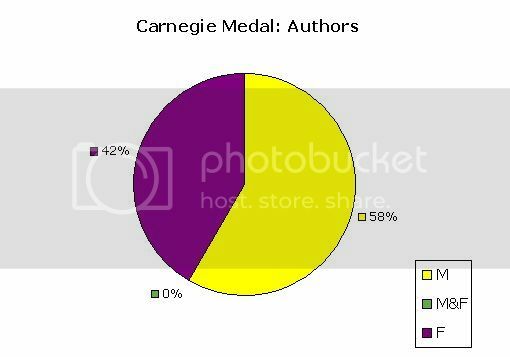 Some of these awards, like the Carnegie Medal, have been around for a very long time, whereas others are quite recent. The decision to start counting from the year 2000 onwards is meant to make the data sets easier to compare, and also to leave aside historical arguments that might distract from the central questions the data poses. Such historical arguments were used to minimise the McCabe study of children's literature over the past 100 years, which uncovered a considerable imbalance in favour of male protagonists. It's possible that things have changed over time in YA, and it would be interesting to research whether they have and how much, but the emphasis here is on contemporary fiction. However, not all these awards have been around since 2000, and this makes a year by year comparison difficult. 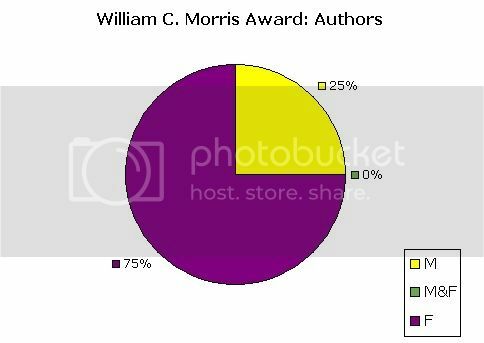 The William C. Morris Award, for example, has only existed since 2009. A sequence of year by year charts that compared essentially different data sets might be more confusing than illuminating, and so I decided not to do one. However, I do think that comparing 2006 (a year when all but two of the awards in our sample already existed) and 2011 (the last year for which all award winners have been announced) might be a useful indicator of trends over time. Similarly, there are no charts by country because the sample doesn't include enough awards from different countries for the results to be statistically significant. When we divide the awards by country, the subgroups we get are too small for us to be able to draw any reliable conclusions. All this to say that we didn't fully exhaust the possibilities of the raw data; if despite these caveats anyone wants to do more with it, they're absolutely welcome to. The definition of "protagonist" used for this project was "main point of view character or narrator": many of the books in question have male and female central characters, but because the argument about the invisibility of "boy books" seems to zoom in on protagonists, this project followed suit. 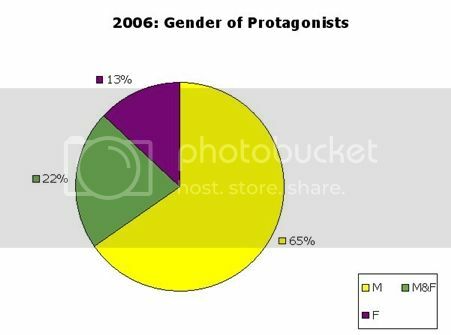 The categories used were "male", "female", and "male and female" for books with protagonists of both genders. This last category was kept separate rather than conflated with the other two for two reasons: in order to keep the numbers as accurate as possible, and because the percentage of books with protagonists of both genders is potentially relevant data in its own right and there would therefore be no sense in burying it and obscuring the results. Oprah: So this is the first time we've met. J.K. Rowling: -- is just a non de [plume] -- well, it's because my British publisher -- when the first book came out -- thought this was a book that will appeal to boys, but they didn't want the boys to know a woman had written it. So they said to me, "Could we use your initials?" and I said "Fine, I only have one initial. I don't have a middle name." So I took my favorite grandmother's name, Kathleen. Oprah: And fooled the boys for awhile. J.K. Rowling: Yeah, not for too long. Oprah: Not for too long. J.K. Rowling: Yeah, because I started getting my picture in the press and no one could pretend I was a man anymore. Oprah: Yes, and I don't think the boys have minded. J.K. Rowling: No, it hasn't held me back, has it? Clearly not held me back. While J.K. Rowling notes that her gender hasn't hindered her success, it's clear from this conversation that her publishers believed it would, and that they pressured her to adopt a gender ambiguous penname before she reached the levels of popularity she enjoys today. 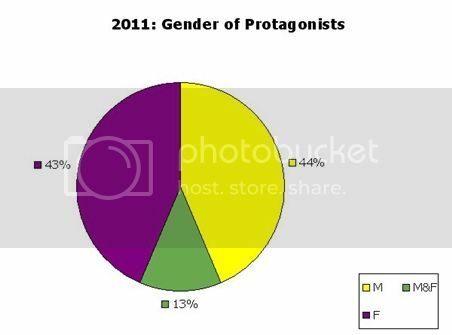 Because this kind of assumption is not uncommon, we did a gender breakdown by author as well as by protagonist. Again, this is in no way meant to validate the notion that it's only right and proper for boys to refuse to read stories by women. I understand that sometimes they will due to sociocultural pressures; however, I believe these numbers will show that even if they do, there are plenty of YA novels by men and about boys, and that this challenges the argument that the large number of women writing YA is what's keeping boys from reading. Because the Printz is arguably the most visible and influential YA book award, the Honor list was also counted, but to avoid confusion these results were not added to the total charts. Lastly, I realise there's a certain degree of overlap here, as there are books and authors that have won multiple awards. This doesn't invalidate the total charts because what is being counted are occurrences (the number of instances when a book by a male/female author and with a male/female protagonist has won an award, rather than individual books or authors). 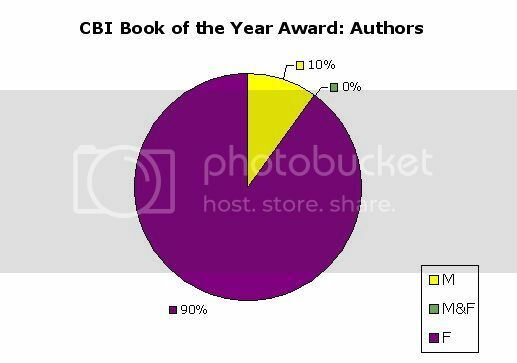 However, to avoid having anyone dismiss the results by claiming it's the same ten books by men and/or with male protagonists winning all the awards, I want to make it clear that our sample includes 227 unique titles and 199 individual authors in a total of 249 entries. 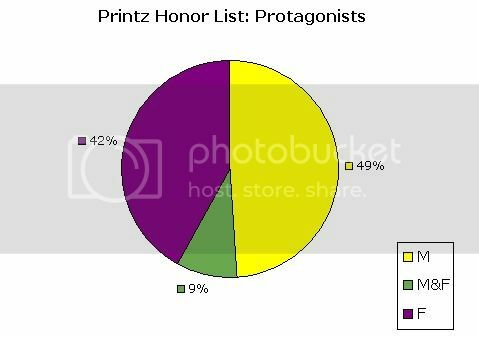 If we take the Printz Honor list into account, these numbers go up to 279 titles and 238 unique authors. As you can see, almost half of YA award winners in the past twelve years had male protagonists, 15% had both male and female protagonists, and 36% had female protagonists. This demonstrates that when it comes to award winners, stories focusing on boys are highly visible. 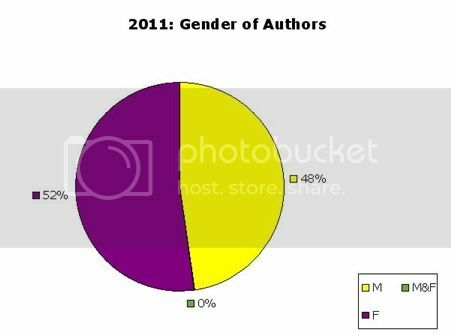 Regarding authors, there are indeed more women, but I would hesitate to call 56% women and 42% men "female dominance". Again, if these results were reversed, we would perhaps be glad that they were so close to being balanced. But because we expect to find male dominance everywhere, we treat a slight predominance of women as proof that women have now become dominant in a way that's unnatural and needs to be fixed. What does it mean that we see a list where female authors are slightly ahead at 56% as evidence that there's a crisis and that men are gravely underrepresented? Do we expect to find male dominance to such an extent that we see anything that deviates from it as a cause for alarm? The "reverse sexism" argument is also sometimes used in these cases, and feminists are accused of hypocrisy for being glad that a list has more women than men instead of demanding a 50/50 gender ratio absolutely everywhere. However, until gender equality has been achieved in the world at large, I'm not going to apologise for being happy to see women slightly ahead in some very limited spheres. Yes, gender equality is the ultimate goal, but there's a long way to go until we reach it and in the meantime I'll enjoy whatever respite I can find. I do of course realise that these numbers tell us nothing about the overall proportion of YA books with male protagonists and/or written by men, as award winners are only a small share of everything that exists. We can safely conclude, though, that stories about boys and/or authored by men are far from invisible. They've been repeatedly chosen by readers, teachers, librarians, bloggers, and industry professionals as the very best the YA world has to offer, and as a result teenage readers are widely exposed to them. Libraries and bookshops do displays based on lists of award winners, and any teen, parent or teacher who asks a YA literacy professional for recommendations is likely to be pointed towards these books. A boy who has been socially conditioned to avoid the feminine, as boys in our culture are, only has to look at lists of award winners to find plenty of books that will keep him occupied while allowing him to avoid confronting his reluctance to read anything "girly". Obviously I do wish this reluctance were addressed and challenged, but it's important to keep in mind that there are plenty of YA books out there that boys who are not yet ready to do so can read. I don't mean for a second to deny that the teachers, librarians, and other literacy professionals who are committed to gender equality and who want to encourage boys to read often have a very hard time, for several reasons. The fact that a problem has sociocultural origins doesn't make it any less real or any easier to fix, and a perceived lack of books with "boy appeal" can cause as many problems as a lack backed up by statistical data. Sometimes this perception comes from teen readers themselves, and professionals who are determined to erode it have a huge task ahead of them. Again, I believe that boys' reluctance to read stories by or about girls and women is not inevitable and should be challenged, but I realise that this is not something that can be achieved overnight. In the excellent book Boys, Literacies and Schooling: The Dangerous Territories of Gender-Based Literacy Reform, Rowan et al talk about "strategic essentialism": the effort many professionals make to meet their readers halfway before they can begin to undo years of social conditioning. I hope that any librarians who deal with their male patrons' very real belief in "girl cooties" on a daily basis, and who therefore may need to begin with books with male or at least male and female protagonists while they work to challenge it, will find this information useful as a point of departure. The crucial thing is not to slip into either biological or cultural determinism and decide that change is impossible before we even try; that this is simply "the way things are". Occasionally people react to these discussions by pointing out that it's hypocritical of feminist commentators to maintain that girls (and people of colour, and lgbtq teens, and disabled teens) need as many and as varied media role models as possible without accepting that the same is true of boys. My response to this is that yes, I accept that boys too have the right to want to see themselves represented in the literature they consume. However, it seems very disingenuous to make this comparison when we live in a world where the overwhelming majority of stories are still for, by, and about men. A quick browse through the Geena Davis Institute on Gender in Media website will show you that this is the case. Even if (award winners aside, as we have just seen) the world of YA were to prove an exception, we can't pretend the impact this has on boys is the same the impact that lack of representation in every single sphere of our culture has on marginalised groups. You can click the charts to enlarge them. As I explained above, because the Printz is one of the most visible and influential YA book awards, the honor list was included in this project but not counted towards the totals. 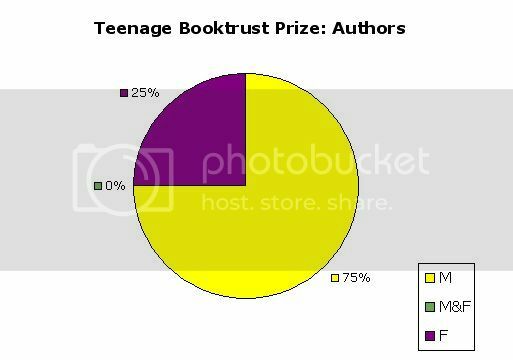 When it comes to authors, the Andre Norton and the CBI Book of the Year Awards have been predominantly won by women, while the BookTrust Teenage Book Prize has mostly been won by men. 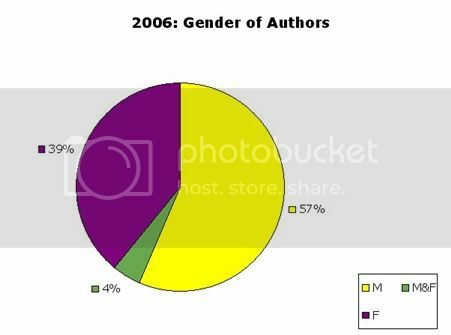 But the general distribution of results shows the same trend that was observed in the totals chart: while there are more female authors, the men are by no means invisible. As previously explained in the methodology section, these awards were created in different years and some stopped existing some time ago. Therefore, a sequence of year by year charts comparing essentially different data sets might be more confusing than illuminating. However, comparing 2006 (a year when all but two of the awards in the present sample already existed) and 2011 (the last year for which all award winners have already been announced) might be a useful indicator of trends over time. Again, you can click the charts to enlarge them. The yearly results should be approached with caution, as we need more than data from a single year to be able to to draw reliable conclusions about trends over time. 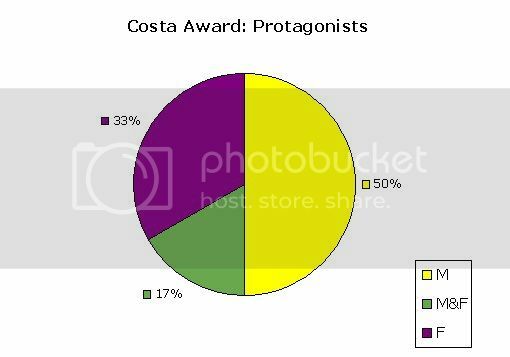 However, they seem to indicate that things might be becoming more balanced when it comes to both authors and protagonists. This trend towards greater balance has coincided with an increase in concerns about female dominance in YA. Again, it would appear that we've been trained to see male dominance as a sign that all's well with the world, and a trend towards equality or a slight predominance of women as a cause for alarm. [@haleshannon Whoops! I wrote the ratios wrong on my blog at first. Male authors lead females 8:2 on all 4 NYT best seller lists for children. I would be very interested in comparing the overall results with data on all the YA published in a given year. If the trend there is as skewed towards women as anecdotal evidence suggests, it's particularly interesting that looking at the award winners alone shows an opposite trend. If stories by and about boys and men are so rare in the world of YA and yet show up in the proportion we've seen above in lists of award winners, then we're disproportionately privileging these stories when we select the best YA has to offer. In a world where anything masculine is still valued to a much greater extent than anything feminine, this possibility worries me. I want to make it absolutely clear that this is not an attack on the committees behind the 22 awards selected. All of us here at LB respect and admire the librarians, booksellers, readers and bloggers who have worked so hard on these awards. They did a great job of drawing attention to excellent YA literature over the past twelve years and I know they'll continue to do so. I'm not very interested in pointing fingers at the members of these committees and accusing them of unconscious biases that I, too, share. As someone born and raised in the world we currently have rather than in an alternate feminist utopia where gender equality has been achieved, I know I have to make a conscious effort to fight these biases, and I realise that this is true of pretty much everyone. I am interested, however, in hearing from anyone who has served in an award committee and who's willing to discuss these results with us. I'm especially interested in whether the widespread belief that YA novels featuring boys are a rarity is at the back of people's minds when they select the very best in the field. Is a male protagonist perhaps something that counts in a book's favour because of a perceived lack? As someone who has never been involved in a YA award committee I can of course make no claims whatsoever about whether this affects selection, but I'd absolutely love to hear from someone who'd like to discuss these questions with us. It's also interesting to consider that the predominance of male protagonists often occurs even in awards that have been mostly won by women, which raises questions about the extent to which we (again, "we" as a culture rather than committee members in particular) tend to reward women more when they write about boys or men. It's possible that people will shrug off these results by saying that the numbers don't matter; it's the quality of male representation that poses the real problem. I've come across this argument in the past, and indeed Jodie and I addressed it at length last year. As I said then, I see the representation of non-traditional masculinities in media as a positive thing, but even leaving that aside, I don't think traditional masculinity is in any danger of being underrepresented. But of course, this is only pitting my impressions against other people's. Perhaps this is a research project for another time. I have also seen claims that it's not the gender of the protagonist but the genre or subject of the book that matters, and that contemporary YA is driving away male readers because it doesn't appeal to boys' interests. 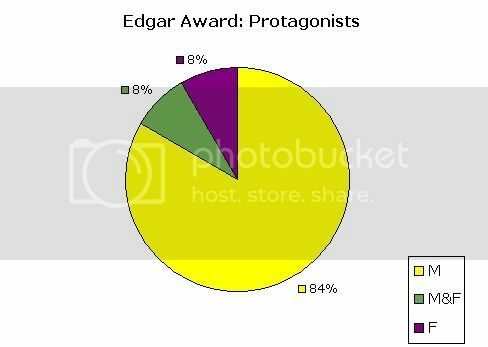 A similar breakdown of award winners by genre and subject would be an interesting project, but the most important thing here is the fact that interests are not inherently gendered. You will find several thoughtful deconstructions of this argument in the "Further Reading" section just below. Additionally, the data from my own MA dissertation also challenges this notion. Lastly, I realise that these results may pose more questions than provide answers. But perhaps we should be asking more question, in which case that's a good enough start. Savidge Reads: Why Don't Men Read Books By Women... Or Do They? After Ellen: Do women rule the literary world? First of all, huge thanks to my collaborators here at Lady Business, Renay and Jodie. Their in-depth feedback, editing, and help with the data collection and verification, with research, and with the initial brainstorming for this project made it much better than it would have been otherwise. Many thanks also to Ana and Thea, Heather, Iris, Amy and Kelly, whose help with the data verification was invaluable, and to ryorin who helped with a question about a particular book. Any remaining mistakes are of course my own. Finally, thanks to all the people who created the content listed under "Further Reading": they've made me feel more sane and less lonely, and helped me further my thinking when it comes to these matters over the years. ETA: I got a few e-mails and tweets from people asking permission to link/share this post, so I thought I'd say right here that yes, you should all feel free to share or link it anywhere you'd like. Obviously I believe this information is important, so any help with signal boosting is very much appreciated. ETA 2: On LizB's suggestion I'm adding a Twitter hashtag to make discussions of these results easier to keep track of. #YABalance is memorable, not overlong, and doesn't seem to be in use for anything else at the moment. Thanks for suggesting it AlexinLeeds! This post is great and you should feel great! Re: This post is great and you should feel great! Thank you again for all your help; I definitely couldn't have done it without you. Has this study been published anywhere? I would love to use it for a research proposal I am doing but all sources must be official, and as official as this looks I am pretty sure they won't accept it unless it has been published somewhere. No, it hasn't - none of us are currently affiliated with a university or research institution and we did this exclusively on our free time. Sorry I can't be of more help! I don't have much to say about this dataset specifically, but I think it's great that you went through this and crunched all the numbers. It's always good to see the truth about gender balance laid out like this. This reminds me of the research that's been done about mixed gender groups: that people look at a group made up of 50% women and 50% men, and see it as being weighted towards women. It takes something like a 25/75 ratio before people think of it as "balanced". Which is just mind-boggling. This also makes me want to pull up that NPR "best of YA list" from earlier in the summer and do the numbers on that, like I did for the "best of SF/F" list they did last year. You definitely should pull up the NPR list! I'd be really interested in seeing the results. And yes, I saw a couple more people mention that study about mixed gender groups on Twitter. I hadn't come across it before, but I'm super curious to dig it up and read it now. KJ! Do you know where you pulled that data from re: weighted toward women? I'd like to be able to reference it in something I'm writing! It's just one of those numbers that I hear around a lot. I looked for a cite the last time we talked about this, and couldn't find one. But I know I've seen this referenced recently elsewhere; let me look again and get back to you. You're definitely on to something. C.J. Pascoe's "Dude, You're a Fag", a book based on the author's doctoral research, does a wonderful job of exploring the relationship between homophobia and the policing of masculinity. Wayne Martino's work touches on that as well. It's really hard to get people to let go of those ingrained assumptions about what people will/won't buy, even when they're not backed up by any actual market research. I'm really glad to hear that boys picked up your book anyway. 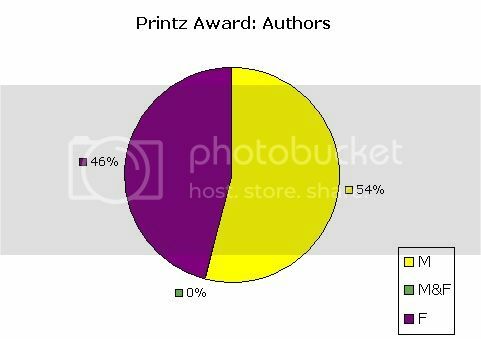 Thank you for this interesting research about the awards. It would be awesome to be able to see all published books because as a writer and reader of YA, my experience has been otherwise. On a number of occasions, I have gone into B&N and compared the # of boy vs. girl books on the facing-out-displays. The ratio is usually 13-1 girls win. The whole area looks like a purplish display of dark girly romance. Have you ever seen a boy section in a bookstore? I haven't. So maybe the issue is visible shelf space in bookstores. In my own publishing journey, I've heard a number of times that my manuscripts are quality but that the industry isn't publishing boy books. My whistle is whet for this topic though, and I await the overall market study. I agree. Books that have received awards form such a small portion of all the YA books out there that really this data is very skewed. I think you'll find that the award winners are most often not the best selling and favorite of the YA titles out there. Please stop calling this data skewed. It is disingenuous to say that because a data project about YA concentrates on a particular section of YA culture, rather than attempting to investigate the proportion of male protags in the whole of YA ever, this project can draw no useful conclusions in itself. This project is not flawed, it is specific and it draws specific conclusions, supported by and relevant to the data that is being investigated. a.) YA books with male protags exist and are far from invisible. 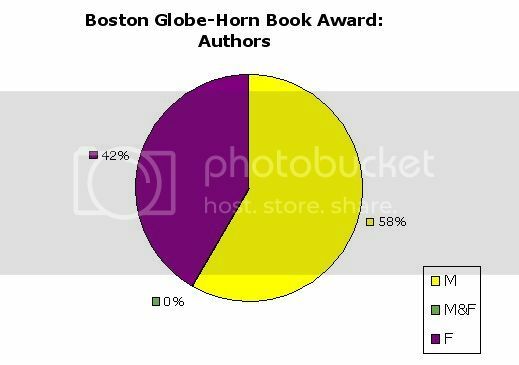 Books like 'Looking for Alaska' and 'A Monster Calls' to name just two books that ended up included in the data for this study are VERY popular and well known. 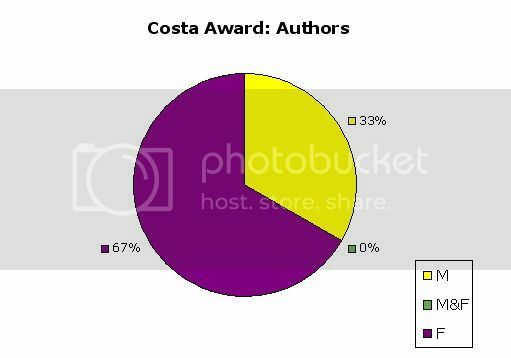 Ana has used whether books have won an award as an indicator of visibility. I think that was a perfectly reasonable choice to make and agree with her explanations for making this choice. If you feel you have a good, different way of ascertaining popularity, or visibility of books among young readers please explain, or feel free to run your own study using that criteria as a base. We enjoy research and specific reasoning. "The project is called "Gender Balance in YA Award Winners since 2000", not "Gender Balance in YA". It's therefore incredibly disingenuous to accuse us of sampling error for using lists of YA award winners in a project about, erm, YA award winners. We were extremely careful not to make any claims about YA as a whole in the write-up, and we repeated quite a few times that we needed more data before we could generalise to the rest of YA. Please feel free to discuss whether or not these results are proportional to what's happening in the field at large - encouraging this sort of discussion is exactly what the project is for. But we would be very grateful if people didn't go around repeating that the study is "flawed" when we were very clear and upfront about our methodology and its limitations and took care to add all those caveats. Doing so is dismissive of the rigour we put into our work and is frankly more than a bit disrespectful." I actually wonder how this compares to books aimed at small children, and then books aimed at grownups. 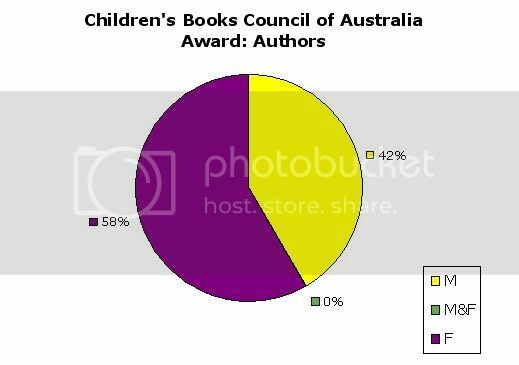 I'm not quoting data here, simply anecdotal evidence, but it would SEEM to me (and I HAVE to emphasize this is just a guess) that a pretty high incidence of newer, say, children's books are by women (thoguh I can't speak for award winners, per se), and that a high incidence of award winning or critically acclaimed adult novels are by men. To an extent - and again, without hard data, tihs is more a musing than a hypothesis - that there is teh possibility of our culture juvenilizing women's intellectual contributions? That the higher incidence of women in YA and picture books, etc, is because we encourage women into that mold. After all, even back into the 19th century, many of the first inroads women made into literature were children's lit, or what we'd now think of as (arguably) YA or at least college age lit (I think if Jane Eyre or Wuthering Heights were written today, arguably, the market would skew them in this direction for example, but thats another arguable statement, of course). I don't know. I'm not an expert in children's lit AT ALL. Have you looked at numbers for younger awards, like the Calecott before? The data on men winning more acclaim in the adult lit world is I THINK a bit more solid - I know there've been several stories about how men dominate the NYT book review pages, for example? I'd be interested to see how they correlate. But again, that's just an idea, I could be completely wrong. "I'm half inclined to say that just 'publishing more books on "boy topics"' is a handicapping gloss to bury a more serious issue. After all, perhaps the problem is that we as a culture need to work harder at not teaching boys that there is taboo topics that they should not read about." Yep, agreed and agreed. This and the social stigma that associates reading with... if not femininity, exactly, at least with inadequate masculinity are my best guesses. It's also the direction where my dissertation took me. RE: your first comment, it would be very interesting (and not a lot of work) to run the numbers for the Caldecott, and also for the Kate Greenaway medal in the UK. Zoë Marriott touches on the writing for young people = women's work idea in her post and makes some really interesting points. This is quite interesting, thank you for writing it! Sorry I haven't finished it yet, so I don't have any intelligent commentary. I was wondering if you happened to know if anyone has done a similar study, but focusing on racial diversity instead of gender diversity? I realize that is outside of the focus on this group, but I was just wondering if you had happened to stumble over any. Thanks! Thanks for writing and compiling this. I was trying to find hard numbers on gender balance between protagonists of YA, because I was quite fed up at a conversation happening on social media wherein a man was advising a professionally published woman author that she should switch the gender of her female protagonist in a story she was currently writing to be male, in order to 'break the mold'. He said a lot more than that, but... well, let's just leave it at it takes some chutzpah to do that much.